The NovaShape is the latest clinically proven advanced system using dynamic resonant ultrasound for fat reduction and body contouring through cavitation. This unique system operates by sweeping specific low ultrasound frequency on the treatment area while selectively targeting fat adipose tissue, creating a mechanical effect of implodes and explodes breaking down the adipose membranes. There is no need for injections, incisions or sedation before treatment commences. Treatments are completely non-invasive and non-thermal. 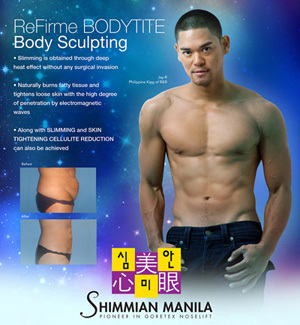 Effective results are achieved in fewer sessions compared to similar body contouring devices. The NovaShape is very affordable and a lucrative addition to any practice. It is completely portable without a fixed frequency or fixed distance superstructure. Cavitation at resonant level is a physical phenomenon meaning that a large amount of micro-bubbles are created due to the fast variation of pressure changes. This mechanical effect of explodes and implodes are strong enough to breakdown the adipose membranes (pressure exceeds 50 Kg per cm2), where fat cells are destroyed and triglycerides are reabsorbed, through blood and the lymphatic system. When this phenomenon takes place in the interstitial liquid of the adipose tissue, adipocytes that are exposed to such overpressure, cause fat nodules to be separated, and for the total rupture of membranes/cell walls in high volume. No effects on the hepatic system were observed. The technology achieves reduction in volume of adipose tissue by a variable resonance ultrasound energy that cause localized cell disruption in a controlled manner. Based on therapeutic ultrasound energy that has a long history of safe and effective application in the medical field. Novashape technology by variable resonance ultrasound energy works on several mechanism of a action, including Ultrasonic localised acoustic streaming for cell disruption, coupled with rise of temperature to above of 54°c threshold in the subcutaneous fat layer, while keeping the surface protected at 8°c. Via unique Skin Contact Cooling™. The NovaShape system uses multi-frequency waves for selectively rupturing adipocyte membranes without affecting surrounding structures. Once adipocytes have been disrupted, triglycerides from the ruptured cells are released Into the interstitial fluid; also, chemotactic signals activate the body’s inflarrimatory response system at the same time. Macrophage cells are attracted to the area to phagocytosc the lipids and ccli debris. This action brings to overall reduction of adipose tissue volume. The operator moves the head across the treatment area, treating one zone at a time. Maximizing patient comfort and safety while maintaining simplicity of use. Radiofrequency energy gently heats collagen fibers causing immendiate tightening followed by continual collagen production for another 4-6 months. Subsequently, a more youthful and toned appearance is seen with improved skin texture and the loss of inches. The best candidates for RF Body contorung are people who have moderate amount of loose, baggy skin from recent weight loss, aging process, or past pregnancy. Our physician-nurse team provides toning, contouring, tightening, and rejuvenation without stitching, cutting, bruising, or down time.